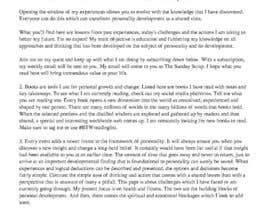 Rewrite the descriptions/email for my Personal Development blog. I am currently setting up a website about personal development. 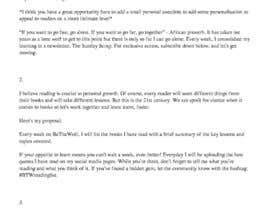 I have four pieces of writing that I would like checked/reworded/rewritten to be SEO friendly/high engagement with reader. The website is [login to view URL] and is currently under construction however you can still view it. Here are the four writings. This is an about page. For readers who are new to the site and first visiting. 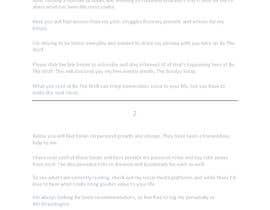 Two goals for this page are to explain the reason behind the site and also to get people to subscribe to my weekly email newsletter with the form located in the footer of the page. "Welcome to Be The Wolf. 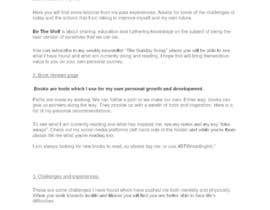 Over the past few years I have been interested in learning about personal development, and more importantly my own personal growth. 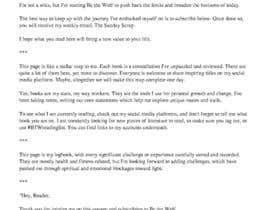 After reading many books and listening to countless podcasts I knew it was time for me to write down what I have learnt, and ultimately utilised. What you’ll find here are lessons from past experiences, the challenges of today, and the actions I am taking to better my future. I’m no expert but education and furthering my knowledge on this subject is my main objective for starting Be The Wolf. The best way to keep up with what I am doing is to subscribe down below, doing so will you will receive my weekly email, The Sunday Scrap. I hope what you read here will bring tremendous value to your life." This page will showcase books that I have read and leave short reviews on. The goal for this page is to make the visitor want to share their own books that they are reading on my social media platforms. As you can see my social links are located on the left hand side of the footer. "Books are tools I use for personal growth and change. Listed here are books I have read with notes and key take aways. To see what I am currently reading check out my social media platforms and while you’re there tell me what you’re reading. I am constantly looking for new books to read so make sure to tag me, or use #BTWreadinglist." 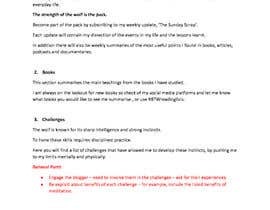 This page is about challenges/experiences which I have faced or am currently going through. For example, a challenge would be 30 days without alcohol, meditating everyday for a month, being on a particular diet etc. "Here you’ll find an array of challenges which push me both mentally and physically. Predominantly health and fitness related however in the future I’ll look to add experiences which have pushed me through spiritual and emotional blockages." This is the welcome email which subscribers receive once they have signed up through the website. 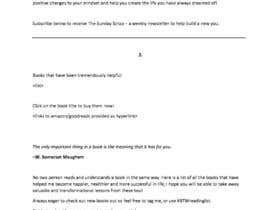 The goal for this email is to tell the subscriber that they will be receiving an email every Sunday, like a newsletter, the email is called "The Sunday Scrap". This email will have 5 bullet points that talk about what has happened in my life over the past week. These can include the book/article I am reading, podcast review, situation I was put in, a quote, documentary viewing. Thank you for taking the first step and subscribing to Be The Wolf. 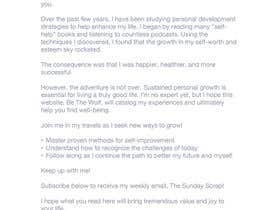 Each Sunday I will give you a snippet into my journey, and what you can take away from it. Can't wait until Sunday? No problem, hit the link below to go straight to my blog. PS. Not only do I want you to follow me, but I want to be apart of your journey also. 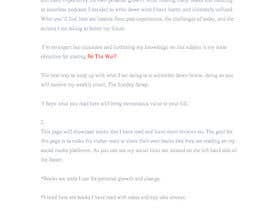 So reply to this email and tell me how you found your way to my blog. GO!" If you would like any more information please ask. Thank you!